Prime Minister Nguyen Xuan Phuc on February 8 visited and presented Tet gifts to over 100 needy workers in the Central Highlands province of Dak Lak. 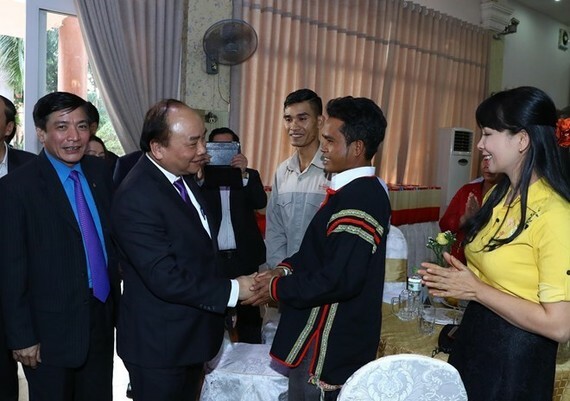 The PM hailed the Vietnam General Confederation of Labour and local enterprises for taking care of local labourers, including organising Tet celebrations for poor workers. He urged the agency to check disadvantaged workers nationwide and Dak Lak in particular to offer timely assistance for them, ensuring they will have a happy traditional Lunar New Year (Tet). The PM also requested the confederation to develop social houses for workers and kindergartens for their children, thus sharing their difficulties. The same day, Prime Minister Phuc also visited and presented Tet gifts to social policy beneficiaries and ethnic minority households in Kram village, Ea Tieu commune, Co Kuin district. Ea Tieu is home to over 4,700 households in 12 ethnic people, mainly living on growing coffee and pepper trees, with the average annual income per capita of VND32 million ($1,400). The commune has 307 poor households and 546 other near the poverty line. It has completed 13 out of 19 criteria of the new-style rural area building programme. The PM requested local authorities to ensure all residents will enjoy the traditional festival. 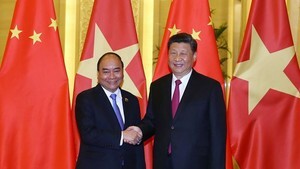 While in Ea Tieu commune, the Government leader also paid pre-Tet visits to Vietnamese Heroic Mothers Nguyen Thi Huong and Nguyen Thi Dom, and local former leaders.